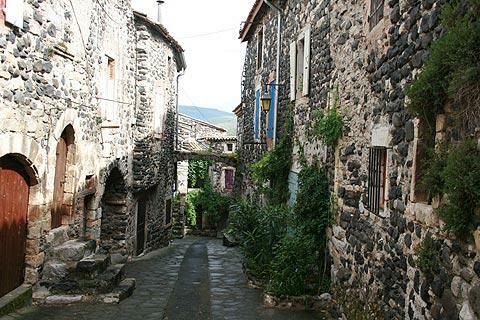 Alba-la-Romaine is situated about 30 kilometres east of Aubenas, and is classified as an Ardeche 'village of character'. France This Way comment: the first impressions when you arrive at Alba are not great - the parking is behind an estate of new-build houses - but persist and you will soon discover a village with a lovely historical centre. Although the village we see today has its origins in the 13th century, there was actually an important town here for several centuries during Ancient Roman times and a Roman theatre has been excavated at Alba. 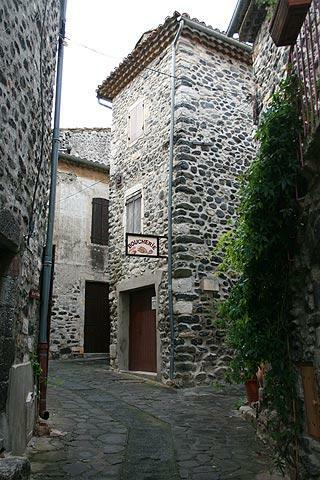 The main village centre in Alba-la-Romaine has two interlinked squares where the market is held and there are various shops and cafes. From here you can continue in to the old part of the village, grouped around and below the castle, and where you will find an extremely attractive series of alleys and streets, all interlinked, often via vaulted passageways, and lined with very attractive ancient houses and overflowing with plants. Most of the houses in the centre of the village date from the 16th and 17th century. 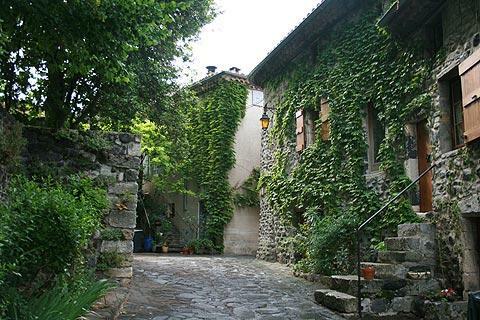 On exploring this historical part of Alba-la-Romaine the village rapidly became one of my favourites among the Ardeche villages of character. There are numerous small features such as balconies, small statues, carefully carved window surrounds and aging shutters that further contribute to Alba-la-Romaine's great appeal. 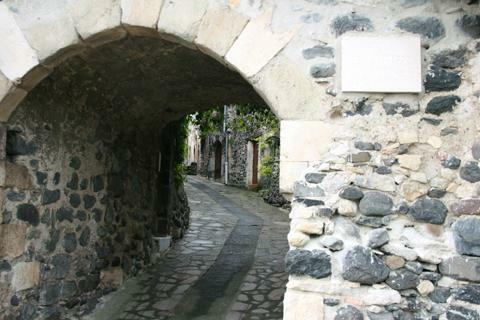 A significant amount of the original 13th century town fortifications can also be seen, and the 17th century Church of Saint-André. The castle in Alba-la-Romaine was originally constructed for defensive purposes, although little is known of the original castle at Alba-la-Romaine. 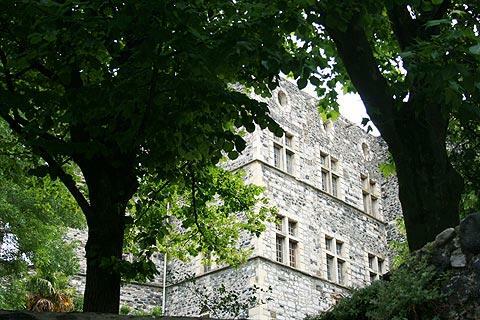 From the Middle Ages until the 17th century numerous modifications and additions were made and the defensive purpose was lost, but the towers and entrances are a reminder of the original castle even if it does now also feature numerous more recent windows and other features. 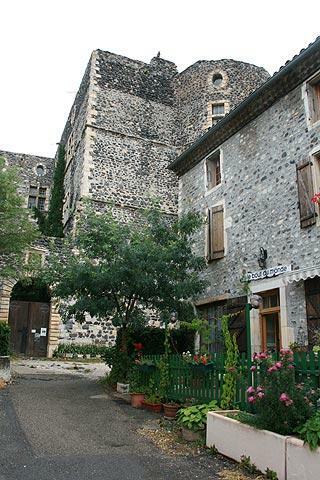 Although the castle dominates the view of the village as you approach Alba-la-Romaine, getting a good view of the castle is not always easy from within the village - it seems to be always slightly out of sight behind a hedge or other building. 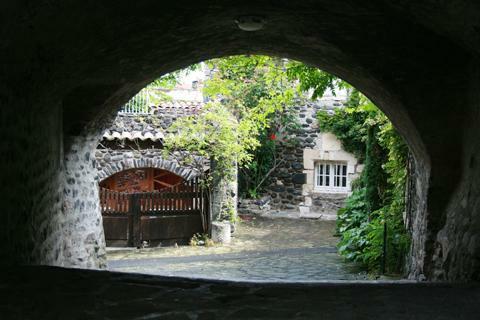 Follow the small street called the Portail de la Trappe that emerges through the 13th century ramparts around the village to give the best view. Just outside Alba-la-Romaine the original Roman city has been excavated and there are several monuments of interest. The Roman theatre is the most important of these but you can also see the remains of a row of shops, a palace and the forum: although the Roman ruins here in the 'Archaeological site of Alba-la-Romaine' are almost all less than a metre high they are quite extensive and nicely renovated and presented. There is now a new museum here, the Muséal, which contains a great deal of historical artefacts discovered here and nearby - and is also in a trendy and attractive modern building! The region around Alba-la-Romaine contains lots of picturesque villages, including some of the other 'Ardeche villages of character'. If your time is limited we particularly recommend Saint-Montan to the south and Balazuc and Vogué to the west.